Choose Gites Corsica for campsites in beautiful natural surroundings! 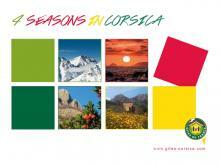 Nicknamed the “Beautiful Isle”, Corsica is a superb location for outdoor holidays. Going camping in Corsica with Gites Corsica is a great way to enjoy Corsican self catering holidays and get back to nature at the same time. Choose one of our quality-assured nature campsites on a farm, at the edge of a forest or in a shady glade, and when you set up your tent, unhitch your caravan, or stop your camping-car, you’ll be right at the heart of delightful natural surroundings! Our Corsican self catering campsites also provide a friendly environment, with a number of sites offering leisure amenities such as games rooms, sports areas, and swimming pools. Spending your Corsican self catering holidays camping in Corsica is also the perfect opportunity to combine the outdoor life with tasting the finest Corsican farm produce, for many campsite owners offer local Corsican specialties such as honey, jam, meats, fruit and vegetables, wine and liqueurs. Delicious! A further benefit of opting to go camping in Corsica with Gites Corsica is that you can do so in the confidence that our quality label defines precise standards of comfort for every single one of the sites we offer. Governed by a national charter, all our Corsican campsites are regularly inspected and assessed, with each being awarded a 1, 2, 3 or 4 ears of corn rating, depending on facilities offered. Say goodbye to over-crowded sites: when you go camping in Corsica with Gites Corsica, you can stay on farm campsites which offer a maximum of 6 pitches and a capacity of 20 guests, while our nature campsites have from 7 to 25 pitches and a capacity of between 28 and 100 visitors. So don’t wait any longer: take a look at the list below of campsites in Corsica, and start booking your Corsica self catering holidays today!